Why Hire a Domain Name Broker? Domain name acquisitions are an important transaction for any company – especially primary domain names for consumer brands. While some domain name acquisitions are fairly easy, many large transactions can be quite complex. Whether it’s a buyer wishing to keep their identity private, timing an acquisition before announcing a funding round or simply trying to find a domain name owner. Almost every domain name deal is different and hiring a domain name broker can be one of your best decisions. Would you buy a house without a real estate agent, appraiser and/or attorney? Would you write a $25,000 check to a stranger? Do you know anything about the current owners relative value of money? How do you contact a domain name owner for a domain name with redacted or private WHOIS? There are hundreds of questions a good domain name broker considers with each acquisition. Not only to set expectations for a buyer but also to ensure the seller is responsive and all parties walk away with a fair transaction. 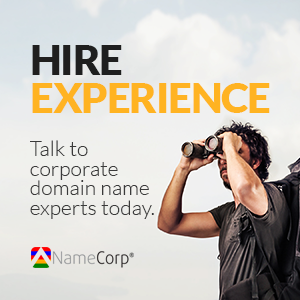 NameCorp primarily works with brands to acquire domain names. We generally do not represent domain names for sale unless they are extraordinary. This focus, and over $50M in experience, provides us with the unique perspective to help guide and complete your transaction.